Beautifully simple to make and with fantastic play value, this wooden bladed katana will elevate you to status of heroic legendary sward smith. A samurai sword is a true work of art. The technique of making the blade by heating the metal up and cooling it down (or quenching it) repeatedly, was used to purify the metal which was often imperfect to start with. The results, even in the 13th and 14th Century with ancient forging equipment, were amazing, and modern swords are judged not to be as good as those made hundreds of years ago by the great Japanese sword smiths. Using a process that included folding the metal up to 200 times and covering it with clay, gorgeous, high carbon steel of immense strength and beauty was formed. The greatest craftsmen could make a blade that shimmered in the light. The shimmering pattern, sometimes likened to shifting clouds is called nie. The Nie is the result of the metal’s crystal structure at the temper line (HAMON) and is like a sword’s fingerprint. The blade fits snugly into the scabbard with a very satisfying action, and the handle is really firm. Samurai swords have become renowned for their sharpness and cutting ability, which over the years has been elevated to almost mythical status. One of the greatest Japanese sword smiths of all time is said to be Gorō Nyūdō Masamune who worked in Sagami Province during the last part of the Kamakura Era (1288 - 1328). 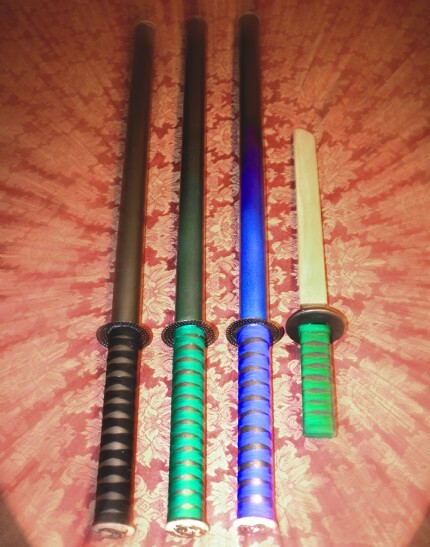 Masamune made many swords but only 50 of them survive to the present day, and all are now legally certified as state property of Japan or imperial regalia. 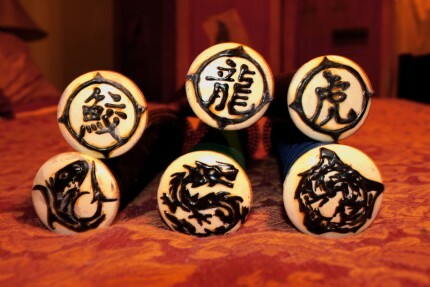 As a result, it is only possible to see them at exhibitions or special sword shows. Even though the blade isn't metal, the smoothly finished hardwood does have a satisfyingly Japanese feel to it... and then of course there's the fact that you wouldn't really want your kids running round with a high carbon steel sword so sharp it could dice concrete. Now you don’t have to train with a legendary 13th Century sword smith, nor fold a blade 200 hundred times to make it as sharp as a razor to have fun and make something beautiful. Become a heroic samurai sword smith in just 90 minutes with this wonderful set of instructions as downloadable pdfs in either A4 or US Letter format. Just click on the format you need. Posted by tinytreasures - We used plain wooden bifold door pulls and painted images on with fabric paint. I just printed up a pattern for the images on the internet and glued them on to the pull and then traced over the patten with the fabric paint. I painted white around the outside of the image to hide the paper edge and then used polyurethane over the top. Polyurethane yellows over time and so the end result looks like ivory. Posted by tinytreasures - This was an awesome project. Using bondo was scary but it worked great. We painted the tubes and metal guard metallic colors that matched the seam binding we used to wrap the hilts. The small sword was for our youngest who is too little to hold the pipe so we used a plastic two liter soda bottle to form a mold for the guard and poured the bondo in. It turned out great as well. 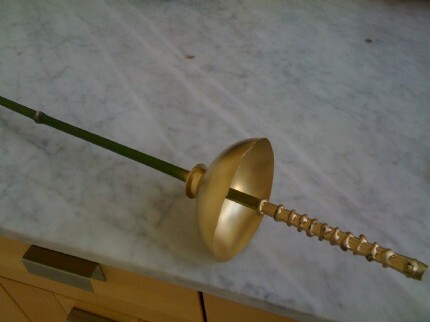 Posted by scintnl - This is not a Samurai sword but rather a fencing sword. It was made with a bamboo stick. the handdele was decorated with plastic gun (like the in the wizard wand project) and the hand cover was made with a soda bottle (as in the glass dome project). I enrolled duct tape around the cane until the bottle neck fitted. 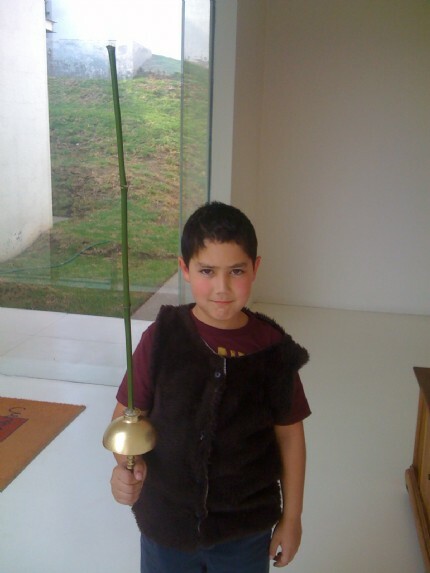 Posted by spyro - This is my Katana my dad made it for me and I took it into school for a show and tell and everyone thought it was brilliant. Once you have made a few models and toys from junk with your kids, they’ll begin to think of things that they would like to make from scratch. 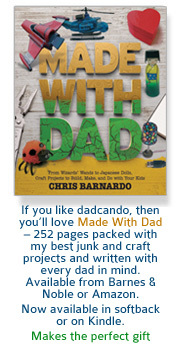 My kids usually start with the phrase, ‘Dad - can we make something?’ Unless you follow a ready made project plan, working out what you are going to make is sometimes the hardest part of the project, and if you don’t know what you are making at the start, you invariably end up with an unrewarding mess at the end. At the planning stage, you are governed by four things: The available materials, your tools, your and your kid's ability and the time you have. The good news is that there are making projects to fit any mix of abilities and facilities. Your materials will be a mixture of junk lying around the house, and the odd bit of some special stuff that you can buy very cheaply. The equipment that you need can almost be limited to a glue gun, some spray paint and a permanent maker. That just leaves your skill level, and to be frank, you don’t need much to make a nice model or toy with your kids that they will love. When you have decided what you want to make, the first thing to do is get yourself some reference. 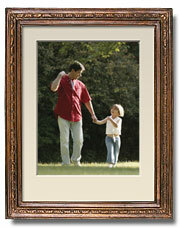 Search the web and have a look at pictures of the real version of what your kids want to make. Print some off to guide you. This ray Gun was based on a weapon in one of my children’s favourite games console games, Ratchet and Clank. Once you have your reference pictures, have a look at what materials you have. Old plastic bottles, boxes, and bits of card are the obvious ones, but get creative. Think of all the things you have in the attic, shed or garden. An old plastic football, a bit of garden hose, a toothbrush, or a piece of aluminium grille are all great starting points for a neat project. The great thing about making something from a console game is that it gets the kids off the game and into some really imaginative play, running round the house or garden, while still feeding into the world of their game. If you can, use the computer design and print out label and graphics that will enhance your model. Dadcando's TARDIS project is really finished off by printouts of the Police Phone Call Box sign, and the smaller door sign, and on this project, we have already drawn up and laid them out to make the job really easy. But you might need something more than just junk, if you are going to make really realistic models. Foam Board is a superb model making material, which will enable you to make just about anything which has a box like shape. The TARDIS and K9 were both made almost entirely from Foam Board. For things that have curves, where no plastic packaging is suitable, you’ll have to resort to Polymorph, papier mache, or Plaster of Paris bandage. To use Plaster of Paris bandage, simply cut it into 300mm (1 foot) long sections off the roll and pull through a saucer of water. It’s very messy, but great fun and dries overnight to a hard finish. It’s great for scenery, very satisfying to use and easy to paint with water based paints when it is dry. To add the finishing touches to an advanced model, nothing works better than a bit of light. LEDs (light emitting diodes) are brilliant for this. They are low power, low current drain (meaning that they last a long time on the same battery), they can be very bright and are small, so they can be put almost anywhere in a model or homemade toy. 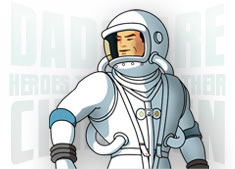 You can find out more about LEDs in the Useful Stuff You Need section on dadcando.com.